Web services tie the web together! Well... almost at least :-) As indicated in the previous blog entry on Modern Module Development we are opting to use modern development techniques in our module as much as possible. A lot of web applications provide some sort of web service end points so that external systems can integrate with their data. In our case we're going to use web services internally for our own module (but we're not limited to just using web services with our own module). In this blog entry we will walk through building out our web service class for our tasks module. Have you wondered how exactly we can get code in our module to post data to the database? Well, I pondered that same mystery for a while, but it's really not such a mystery. The Task Controller Class is the "Traffic Director" between our module's code and the data in our database. In this blog entry we'll walk through the process of creating the TaskController class and sending data to our Tasks Table in SQL Server. Stored Procedures are scripts that get repeatedly executed in our database and they help us to have a "loosely coupled" system with separation of concerns. By using Stored Procedures we're also helping protect our data from SQL injections. In this blog entry we're going to walk through the process of creating our first stored procedure. The "GetTasks" stored procedure will handle the repetitive task of retrieving tasks from our tasks table in SQL. In the previous blog entries we’ve covered a lot of ground and are now at the point to where we actually need to return some data. Though, in order to return data back out to our view control we must first have a table in our database where data can exist! So, in this blog entry we'll walk through the process of creating our "Tasks" table in SQL Server so that we'll have a location where all of our task data and information will reside. In order for your module to be user friendly and provide a pleasant user experience we need to have a nice user interface. User interfaces and user experience on your site (UI/UX) is critical to the success of your site. There are several different ways you can layout the design of your module. Ultimatley you should keep the end user in mind. In this blog entry we will layout and style the user interface of our View control. One awesome feature about DNN Module development is that we don't have to start completely from scratch! That's right, those who have gone ahead of us in the module development journey have freely contributed back to the community by donating their module development templates for the rest of the DNN Community. In this blog entry we'll walk through using Chris Hammond's module development template as it will help us be most efficient in our module development quest. 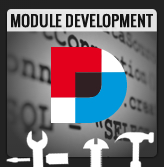 Are you wondering what we will and won't cover in our module development series? In this entry we'll take a look at the UI (User Interface) of the module that we aim to create in this series... the "Tasks" module as well as look at some of the items that we are omitting from this series. I am omitting some advanced topics around module development. Keep in mind that we are simply trying to get our foot in the door with module development in this series. Before we can actually develop a DNN module we need to have a DNN site! If you have never installed DNN before then this entry is for you. This blog entry walks you through the process of downloading the DNN install file, ensuring IIS is properly installed and configured, database creation, host file updates, and walking through the DNN install wizard. Once you have successfully installed DNN you have just unlocked all kinds of potential and possibilities. The fun is just beginning with this blog series.